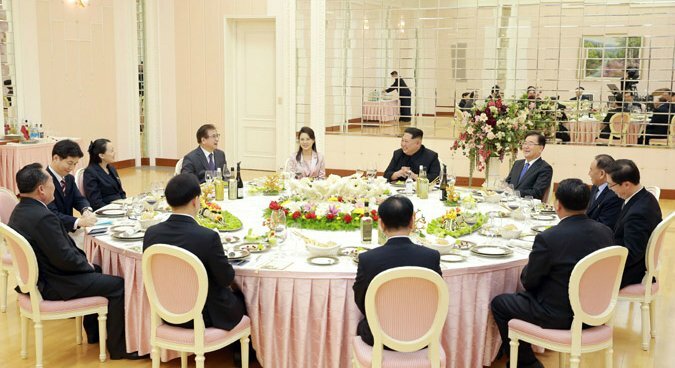 Five South Korean special envoys met with the North Korean leader and attended a banquet on Monday from 1730 to 2142 Pyongyang time, Seoul’s presidential office said on Tuesday. State-run media the Korean Central News Agency (KCNA) said Chief of the National Security Office (NSO) Chung Eui-yong had delivered a personal letter from South Korean President Moon Jae-in to the North Korean leader. “Hearing the intention of President Moon Jae In for a summit from the special envoy of the South side, he exchanged views and made a satisfactory agreement,” KCNA said in an English-language dispatch on the meeting. It remains unclear what precisely has been agreed to, however, with the Blue House saying Tuesday morning that further details will be announced later in the day when the South Korean delegation returns to Seoul. 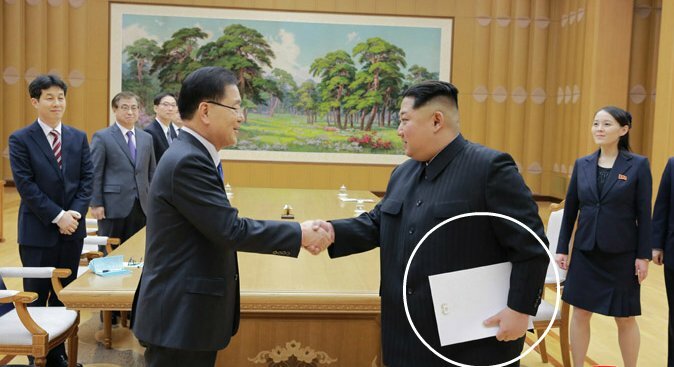 North Korean special envoy Kim Yo Jong last month invited Moon to Pyongyang on behalf of Kim Jong Un, at a meeting held the day after the opening ceremony of the PyeongChang Winter Olympics. KCNA said Kim held an “open-hearted talk” with the South Korean special envoy on issues related to “actively improving” inter-Korean relations and fostering stability on the Korean peninsula. “He also made an exchange of in-depth views on the issues for easing the acute military tensions on the Korean Peninsula and activating the versatile dialogue, contact, cooperation, and exchange,” KCNA reported. 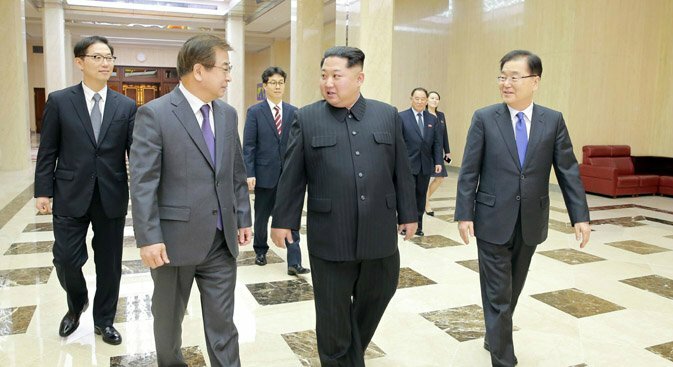 The North Korean leader previously ordered his government “take practical measures” for the improvement of the North-South relations, at a debriefing following the Kim Yong Nam and Kim Yo Jong-led delegation’s visit to the South last month. Kim Dong-yub, a Professor at the Institute for Far Eastern Studies at Kyungnam University, told NK News that Pyongyang appears to be concentrating on improving inter-Korean relations rather than its relationship with the U.S.
“I believe the priority of the special delegation’s visit to North Korea is the inter-Korean relations and the denuclearization and the relationship between the North and the U.S. should be the next,” Kim said, citing concerns about Seoul’s stated desire to raise denuclearization at the summit. “Of course, the North-U.S. ties can’t be separated from South-North relations,” Kim added, saying that inter-Korean relations should not stalled by Washington and Pyongyang’s failure to communicate. During a news briefing in Seoul, Blue House spokesperson Kim Eui-kyeom on Tuesday said both the reception and banquet were held at Jindallae room of the main headquarters of the ruling Workers’ Party of Korea (WPK). This is the first time that South Korean officials have visited Pyongyang since Kim Jong Un took power in 2011 – and the first in history that they have been invited to the ruling party’s headquarters. The special envoys attending the meeting and the banquet include Chung, Director of the National Intelligence Service (NIS) Suh Hoon, and vice unification minister Chun Hae-sung. Second deputy director of the NIS Kim Sang-gyun and Yun Kun-young, a senior Blue House official in charge of monitoring state affairs, participated in the meeting and banquet. “There were results, and my understanding is that the results are not disappointing,” a senior official at the South Korean presidential office – who wished to remain anonymous – told media. 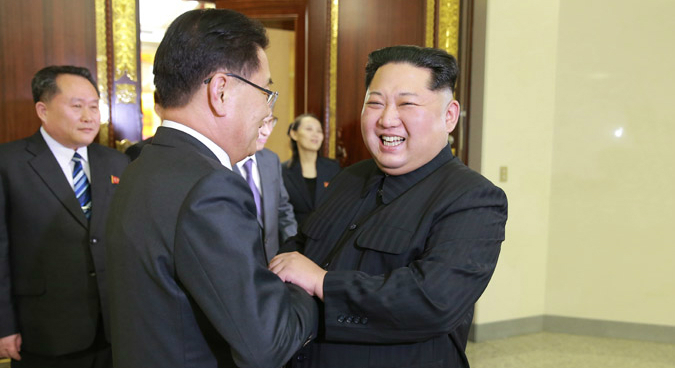 When asked by whether the two Koreas came to a specific agreement at the meeting, the official said: “it seems,” adding that the special delegation will make an announcement upon returning to Seoul later today. In addition to Kim Jong Un, the Blue House said the leader’s sister, first vice department director of the ruling party’s Central Committee (CC) Kim Yo Jong was also in attendance, as was Kim Yong Chol, vice-chairman of the WPK CC and director of the United Front Department of the WPK CC. DPRK First Lady Ri Sol Ju and Chairman of the DPRK’s Committee for the Peaceful Reunification of the Country (CPRC) Ri Son Gwon, too, dined with the ROK delegation, as did deputy director of the United Front Department of the CC of the Workers’ Party of Korea (WPK) Maeng Kyong Il and Kim Jong Un’s chief secretary Kim Chang Son. All the North Korean officials in attendence – with the exception of Ri Sol Ju and Kim Jong Un – had previously visited the South during the PyeongChang Winter Olympics. 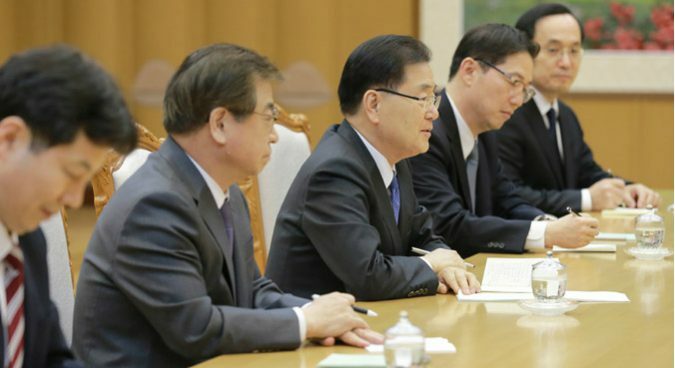 The 10-member South Korean delegation, which is composed of the five high-level officials and five staff, is now scheduled to hold a follow-up meeting with North Korean officials before returning to Seoul on Tuesday afternoon. Subscribe to read the remaining 1026 words of this article.